Sometimes its as if our role as women in society has been decided and marked in stone before we even have a chance to carve it out for ourselves. Our roles as mother, wife, daughter, sister and more recently as a member of the working class are almost rigid in their need to define how we feel about ourselves and as they are about how we define one another. On one hand, we should each commit to our own ideal and self-defining concepts ﾖ unfortunately this isnﾒt the way it is. Instead we try to shape ourselves into convoluted molds that society has given us. The ones that our mothers have unwittingly handed down to us. 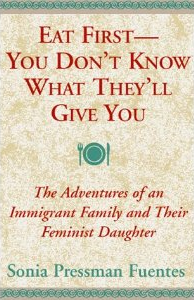 In reading a memoir by Sonia Pressman Fuentes entitled Eat First ﾖ You Donﾒt Know What Theyﾒll Give You I was able to see a woman who grappled with the same issues that we all fight with. How do we define ourselves as women while still staying true to our roles as Mother, Wife, Sister, Daughter, and Worker? In fact, Ms. Fuentes added several more roles to her list: not only is she all of the above, but she is also Jewish, the daughter of immigrants, and a feminist. The milestones of her impressive career are detailed in her text, but what is most important about her book ﾖ and the reason I would recommend it to all budding feminists and all women in general ﾖ is that itﾒs more than a story of a womanﾒs struggle to meet the obligations of her roles. Itﾒs that, too, of course ﾖ as any text written by a female is bound to be. But itﾒs not just that. Itﾒs also a story of love, affection, family, hopes and dreamsﾅand itﾒs funny. Sonia Fuentesﾒ natural voice is so wonderful that we cannot help but imagine that we are her charmed friends, sitting around with cups of tea, while she tells us intimate details of her life. A life that was worth living because it was filled with the love and laughter that we should all hope to have for ourselves. What does this mean to the feminists that read a memoir of one of the founding members of the National Organization for Women, and the first female attorney in the General Counselﾒs Office at the Equal Employment Opportunity Commission? This means that Sure, you are a mother. You are a wife, a daughter, a sister, a lover, a writer, a worker, a feminist, perhaps a disciple. You can be all these things ﾖ they do not define who you are as much as the people you have loved and shared your life and laughter with. This is more than who we are and what are roles are. Ms. Fuentesﾒ book should be a marked reference guide within all of our libraries for what we hope for ourselves: her roles ﾅeven feminismﾅ did not rule her life, but only added to it.